The CKAS OpenFRM Single is a low to mid cost 3 or 6 degree of freedom (3DOF/6DOF) simulation platform targeted at simulator builders who are seeking to quickly develop a medium to high fidelity motion simulator of any kind for up to 1 person. The OpenFRM Single comes with a choice of two different motion systems and can be turned into a motion simulator very quickly with little addition of parts from the simulator builder. 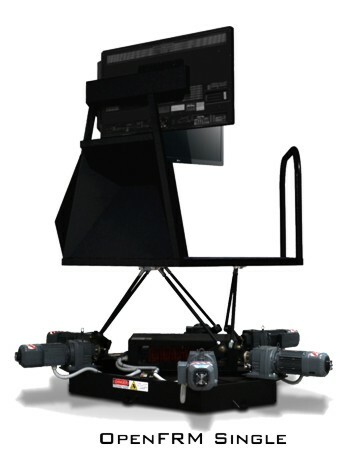 The OpenFRM Single system provides a solution to ALL the difficult engineering for a simulator builder, allowing them the opportunity to focus on producing the cockpit fitout (such as controls and software) to produce a high quality 3DOF or 6DOF motion simulator for any application. The CKAS OpenFRM Single is based around the W5 6DOF Motion System or the U5 3DOF Motion System, which feature some incredible response and fidelity. CKAS W5 6DOF Motion System (for highest fidelity) or CKAS U5 3DOF Motion System (for mid fidelity applications). Rigid steel framework and assembling hardware (screws/brackets/etc) which requires some very basic assembly to hold the main structure on the motion platform. Rigid prefabricated steel structure to hold up to three typical 42” LCD or LED monitors / TV's (VESA 400 x 400) for total immersion offering a substantial 40o vertical and 180o horizontal field of view. Rigid steel contructed and 25mm multi-ply floor for installing all the cockpit components such as seats, controls and other components. Monitors / TV's are not included –The monitors are not provided since all customers are able to purchase them locally far cheaper than being shipped from CKAS in Australia (We recommend 42" with low profile bezel and 400mm x 400mm mounting systems at rear).